All your dreams come true? I told you guys we had some amazing news!!! Anyone who has known me, and most strangers who spend more than 10 minutes talking to me on the street, most likely has heard more than an earful about my lifelong dream of owning my own stable. I've had the worst time trying to keep this "under wraps" but as of last week I officially own 12 acres and we have started making that dream come true! We've actually been working slowly on the fencing over the last four-five weeks and the barn foundation and barn started last week. Thus far its been an outrageous headache but no one ever said that making your dreams come true would be easy right? I don't think I've ever been this stressed out, tired, and thrilled all at once but I wouldn't trade it for the world! Who ever said that wishing on a star wasn't worthwild, it might have taken me a million of them, but all of my dreams seem to be coming true all at once! I'm going to try to keep a record of things as they happen and I'm going to have to do a little back posting as though we are not far along in the construction process there has already been enough bumps in the road, delays, and events to keep me writing for weeks and never catch up! And those of you that have been following on facebook and have attempted to contact me please be patient. I have been working either on this project, filling orders for Blue Pony Tack, or working on my parents rental house pretty much nonstop and I'm at my desk very little these days and will continue like that until this project is complete! Just to bring a little smile to your face. 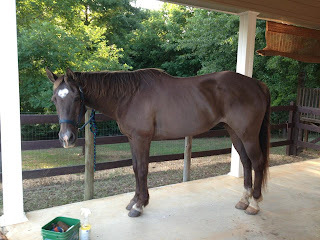 Tarheel has been gaining lots of weight since he returned home and he has made this process SO much easier for me. Nothing and I mean nothing compares to driving up and calling for him and seeing that horse streaking across the pasture to meet me at the gate. I didn't forget you guys! I have so much to share that I'm bursting at the seams! I had to put my blogging career on hold the last two years as much as I hated to, and as much as I missed you guys both here at at Super Hero Boy but so much has changed over the last two years that I'm nearly beside myself with joy to share it! Some of you following my facebook page and facebook storefront may already know one of the big items I have to share, but the other one is still sort of (there has been hints made online) top secret. I will reveal that one in the near future as well! The first big news since my last blog is sort of sad, sort of happy, but we sold Piper. I know its something I said I would NEVER do, but it was really time. 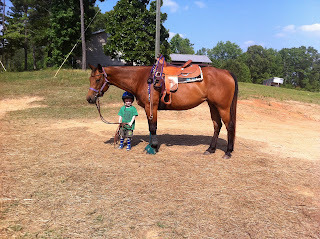 We purchased Piper as a therapy horse for my son Dylan who at the time had a pending CP diagnosis (thankfully it turned out that they were wrong and after a year of fairly intense physical therapy he made a full recovery) and to be my trail riding horse as I recovered from breaking my arm that same year. Though we had our ups and downs in our training progress she was a total godsend when it came to the kids and was by far one of the most reliable trail mounts Ive ever owned. I am so proud to have called her ours, and even more proud of the progress she made while she lived with us. She really went from something really nice, to something VERY special. In the end the right family came along and we passed her along to a very deserving family and little girl who cherish her as much as we did! With all that said, sometimes I think that making a decision that almost breaks your heart in the end opens you up for really amazing gifts and selling Piper was in many ways the domino that started the current trend of amazing news of us. The first of which was buying our first welsh cob section D, which has always been a dream of mine, who I hope to start making some progress with in the next few months. She has had some time out of work and she's got a solid base to work with but she's rusty and has some trust issues that we will need to work through. Otherwise she's absolutely goregous and more than I could have ever hoped for in our first section D cob. Otherwise, the real news of this post is.......... (drum roll please)...... One of the things I have always hoped for and wished for finally came true. Mind you its about 15 years late, but for those of you that know me and for any of you that have read anything Ive ever written about horses... you'll have some clue as to how much this means to me. Tarheel Mac, my youth show horse, came home after 18 years being gone! He is 31 years old this year and he is still as much of a blessing as he was to me in my teens as he is to me now. My heart overflows with joy every single time I see him standing out in the pasture. He needs to gain a little bit of weight but overall he looks fantastic considering his age. I will write more about him in the upcoming months (if you're following me on facebook you'll see more up to date posts) but lets just say its a dream come true! Those of us that know us or have been following on facebook know that Piper has one flaw and only one flaw... she's allergic to gnats. Actually as soon as she started shedding her hair in the spring I realized we were going to have some issues this summer especially with the especially hot and dry temperatures we've had in Alabama. The first thing I did was order her a fly sheet, hood, and fly mask combo hoping to be proactive before the problem really got underway. I however quickly realized that the blanket I ordered her was not only too heavy for our super hot summers but the weave on it was too open and though it did do an excellent job of keeping off flies though it did nothing at all to protect her from those awful gnats and mosquitoes. 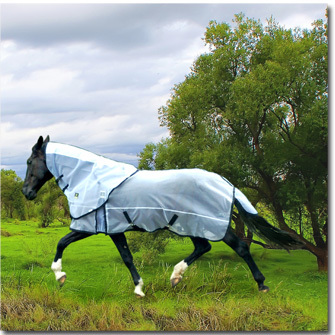 So in my quest to find the perfect fly sheet I came across TurtleNeck and their awesome line of blankets. We were lucky enough to get a TurtleNeck Fly Away Turtle to review and I can honestly say without any reservations that this blanket totally changed Piper's life. I just can't say enough about this fly sheet and I'm honestly not even sure to begin as I could go on for three pages about how much I absolutely love it and what it has done for Piper. The biggest thing is the material the sheet is made out of as it is made from woven thermoset monofilament nylon.. or what you might know of as fishing line. 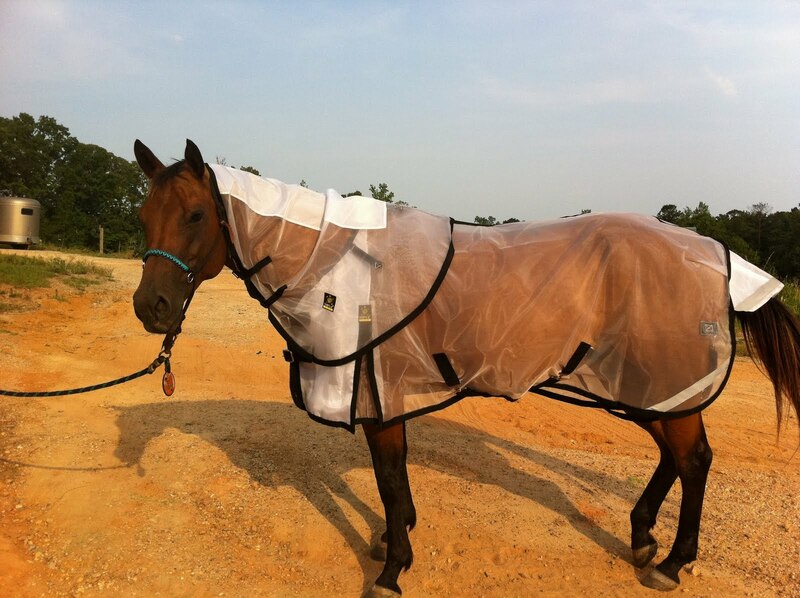 It not only makes this the most breathable and lightweight fly sheet I have sever seen! Not to mention the fact that the weave is very tight so it protects against even the smallest of bugs. The coolest thing though is the neckline as its totally stretchy, as well as all of the straps, giving the blanket not only a really custom looking fit but its the ONLY blanket that I've ever owned that does not shift, not even when Piper lays on her back and scoots. It always comes back up with her exactly where it was before. Piper has been wearing her Fly Away Turtle 24/7 in rain or shine and even on the hottest of days for three weeks now in a paddock turnout with four or five additional horses. 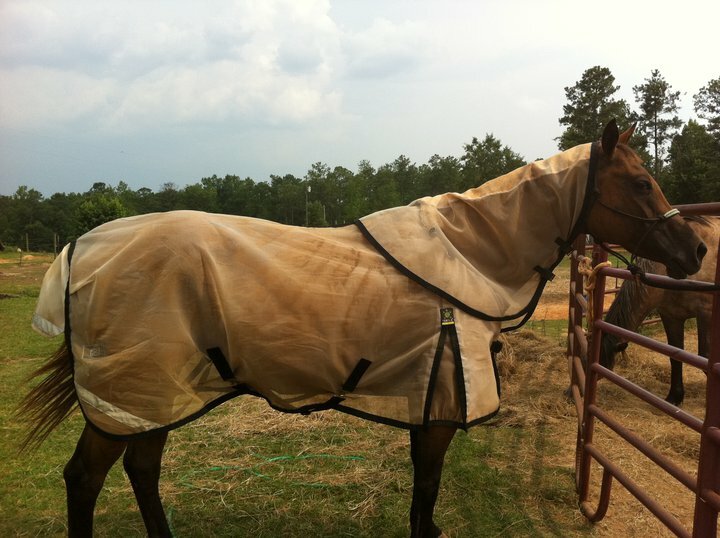 Even with rough play, her scratching, rolling, rain, mud, and other nonsense the blanket looks great and doesn't have any wear marks to speak of. Actually the only thing that has happened to it is since we have clay soil when she rolls in the mud it turns totally red (it is usually white) and it's been slightly stained off pink from the dirt. I can't honestly tell you if that will come out as Piper lives night and day in that sheet and I've not taken it off her long enough to wash it and the only maintenance we have done is rinsing it off with the hose (while it is still ON Piper) if it gets really muddy. It has left no wear marks anywhere on her and Piper's coat is by far the best its been all summer as she has had no new itchy spots spring up since we started using the Fly Away Turtle and most of her older ones especially the spots on her shoulders have regrown most if not all of their hair! The Turtleneck Fly Away Turtle is priced in the higher range for fly sheets at $125-$150 for both the fly sheet and the hood (which IS removable) but it comes with a one year warranty against rips, tears, bites, and pretty much anything else your horse can throw at it to the "shell" of the blanket. It does not cover damage due to bob wire, improper washing or otherwise improper use. The warranty covers the blanket only not the binding or straps. However it does come with an extra set of straps and hardware that you can replace yourself if needed. In the end seeing as it is not uncommon for me to have to replace a fly sheet twice in one summer do to bites and rips from standard horse wear and tear the Fly Away Turtle is a steal at that price. Though honestly I would be highly surprised if we have to send Piper's blanket in for repair even with as much as she wears it. It's by far the sturdiest fly sheet we have ever seen even with how lightweight it is. The only complaint I have about the Fly Away Turtle is that they do not have a matching fly mask. We've gotten so spoiled by the fly sheet and the improvement in Piper's coat that I'm actually really bummed that her face is still for the most part hairless. She wears a fly mask made by another company and though it does the job it does not protect her nearly as well as her blankie does. You can learn more about TurtleNeck products and search for a retailer near you or online to buy your own by visiting the TurtleNeck website. Growing up I learned very quickly that there were two things expected to be in your grooming tote to go to shows, ShowSheen and Baby Oil. I'm fairly sure there were more days than not in the summer that I woke up to the smell of ShowSheen and went to bed smelling like it too. I think everyone who has ever owned a show horse has a bottle of ShowSheen somewhere lurking in their grooming box. The new ShowSheen Finishing Mist works very much like the regular ShowSheen with a major upgrade. Especially the bottle itself. It is in a continuous spray non-aerosol can which can be sprayed in any direction including upside down. The bottle is very quiet and most horses, even the jumpy ones, will most likely not even notice that you are spraying it at all. When it comes out of the bottle it leaves almost a white foam on the horse for just a few seconds before it drys clear which is nice as you can see exactly where you just sprayed it. I especially like the fact that you can be much more exact as to where you are spraying it so you don't end up spraying more than you really needed to. The ShowSheen formula had some upgrades as well. The biggest and most noticeable is the smell! This stuff smells amazing!!! They added jasmine and sandlewood to the mixture and the result reminds me more of a spa product for humans than something for horses. I absolutely love it and after spending a stinky day at the barn I'm really tempted to just turn around and spray my own hair with it! Heh. The formula itself has been upgraded as well with the addition of vitamins and silk proteins, the result is a more conditioned feeling finish. My only complaint with ShowSheen over the years was that it did dry out the hair with extended usage. I've been using this mist for about a month now once or twice a week and I've not at all seen that to be the case with the new formula. The upgrades to the formula is in both versions the Finishing Mist and the original as well. The best part and always my favorite thing about ShowSheen is you can use it once a week or between baths and pretty much all you need is one application. I can spray Piper's tail on Monday and come back on Wednesday or Thursday and it is still as slick and shiny as it was when I first sprayed it. It's also the only product I trust to white socks before a show as well a know that you can clean them all you want the night before a show and you will wake up to a totally stained horse. ShowSheen will prevent stains from happening in the first place and keep the hair slick and dirt free. If you have a white horse it will certainly keep you from having to bath them quite so often! The only downfall I can see at all to the new ShowSheen Finishing Mist is the fact that the can is not refillable. So if you like to buy the gallon sized containers to save money you pretty much have to stick to the original formula. However the can is very convenient to stick in your pocket at shows and very easy to use. My four year old absolutely loves it as he can spray it without issues where he has a real issue with large spray bottles. You can learn more about ShowSheen Finishing Mist on the Absorbine website! You can also download a coupon for $2 off any Absorbine product good till December 2011! Disclosure: We were given a bottle of ShowSheen Finishing Mist free of charge, we were not compensated for this post in any other way. My opinions and comments on items we review are always my own and are never influenced by sponsors! I've been using natural skin care products on myself and on my children for as long as I can remember. I even used to make an awesome tea tree oil based soap that will work magic on itch winter skin, allergic reactions, and mild escema outbreaks. Though I have to say even I as a little bit skeptical when it comes to even considering a natural fly spray alternative. Though my intrest was certainly peaked when Ferrell Hollow Farm contacted us about doing a review of some of their natural horse care products. Ferrell Hollow Farm is a horse retirement farm and their products are inspired by the horses on their farm. Ferrell Hollow Farm's Natural Fly Spray is a mixture of pure essential oils of catnip, peppermint and lemon eucalyptus with apple cider vinegar, neem and garlic oil. My ex trainer from last fall made jokes that it was made to repeal everything from flies to vampires as it does when you first apply it smell pretty strongly of garlic. Once its been on your horse for a few minutes I honestly think you smell more of the apple cider vinegar and eucalyptus and though its not overwhelming it does smell much differently than a standard fly spray. As far as comparing it to my normal fly spray it seems to work about the same as my name brand fly spray with one major difference. Last year as fall approached we had a really really bad month of horse flies. They were terrible to the point that Boo Boo and Zoomie both would kick and even buck when they got bit and nothing seemed to stop them from attacking the horses. 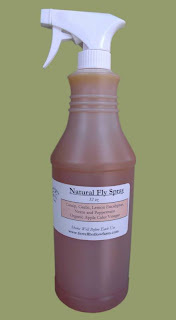 The first evening I used Ferrell Hollow Farm's Natural Fly Spray I immediately noticed a huge difference in the amount of horse flies buzzing about us. I got into the habit of using the Natural Fly Spray before each ride and when I turned Zoomie out for the night and it was really rare to find a horse fly going after him. The ingredients in Ferrell Hollow Farm's Natural Fly Spray are safe to use on horses with sensitive skin and around children, pets, and I happily sprayed my horses with no though even when my baby was nearby without fear of it getting on his skin. Really honestly the only big drawback I can tell you to using the Natural Fly Spray over a conventional spray is the smell. It really does smell like your spraying your horse's with a strong smelling salad dressing especially when you first apply it. Though I have to admit the smell makes me hungry more than anything else, heh. 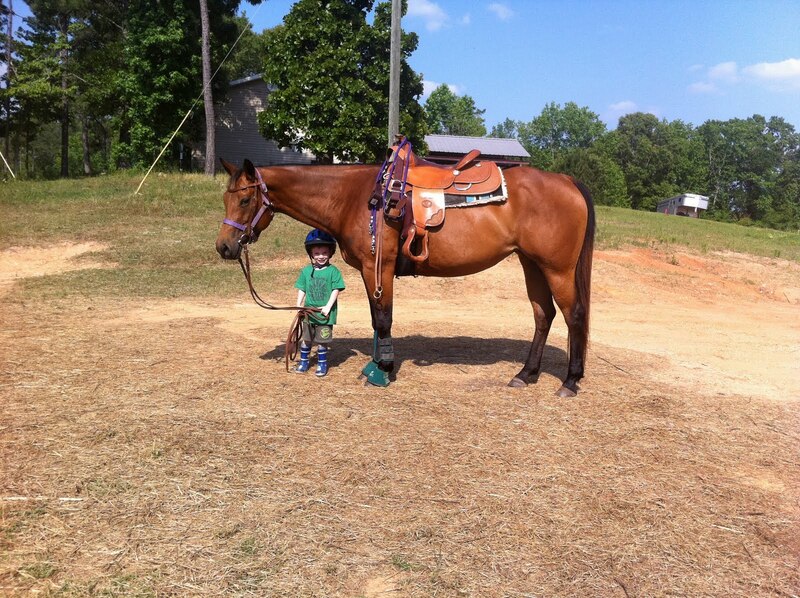 You can check out the full line of natural horse care products on the Ferrell Hollow Farm website! Disclosure: We were given a bottle of Ferrell Hollow Farm's Natural Fly Spray free of charge, we were not compensated for this post in any other way. My opinions and comments on items we review are always my own and are never influenced by sponsors! 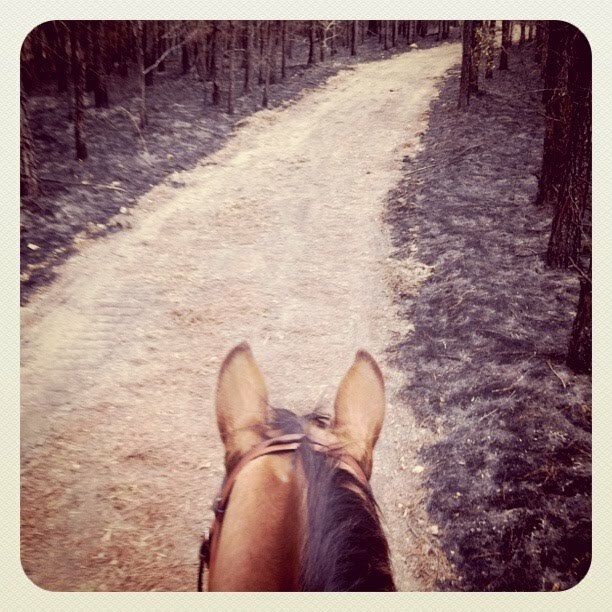 We were introduced to Cut-Heal's Hoof Heal last fall before we took the short break from blogging. We had just sold Zoomie to a lady in Ohio when during his vet check the absolute unthinkable happened. 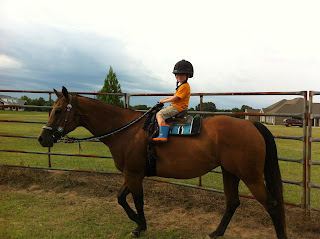 For some reason the tack room was locked that day and Zoomie's bell boots were locked inside. I know I've been told a million times over never ever lunge a horse without bell boots but up till that day I had never had an issue. Zoomie typically does not overreach so I never thought twice about it. On the very last go around he got a little silly and bucked and came down on the coronet band and frog of his front foot with his back. The resulting injury was quite dramatic as he ended up loosing a large chuck of the back of his hoof and a good portion of the back of his frog as well. The cut extended above his coronet band as well and though a non horse person would have looked at the cut and thought it was no big deal, coronet band injuries can affect the proper regrowth of the hoof. 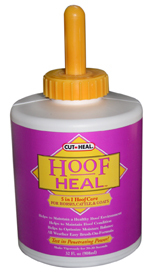 Thankfully the good people at Cut-Heal had sent us a bottle of Hoof Heal just days before the injury happened and I quickly shot them an email to ask if it was safe to use Hoof Heal on such an injury. I did wait about a week as the foot was wrapped in hopes that the shaved off part of the hoof would reattach but we never did get that lucky. Once his hoof dressing was off I started using Hoof Heal daily until it was time for Zoomie to leave for Ohio. The results were really quite dramatic.. though I was unable to save the shard that he shaved off the back of his hoof I saw foot growth and he was back to being totally sound within two weeks of his injury and noticeably sound within a week of starting treatment using Hoof Heal. I am still really quite stunned by the results. 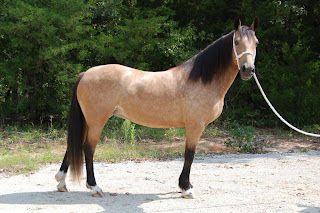 Recently we purchased a new mare who has really great feet that do not seem to have any issues with crumbling or cracking even barefoot with heavy riding. However she is very tender footed and came to me with some existing thrush issues which have resulted in a pretty soft sole and frog. 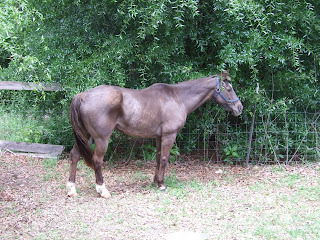 Though I keep her on a dry lot with no moisture her thrush especially in the front feet have gotten worst. What you might not know is that Hoof Heal is excellent as a thrush treatment. Currently Piper is laid up with what we think is either an abscess trying to pop through or a stone bruise. I've been using Hoof Heal for about a month now twice a week to the tops of her hooves but when I noticed her frog start to soften and the thrush smell start to get worst I also started applying it to the bottom of her clean hooves as well. We are now officially on her third application to the bottom of her hooves and I already notice a huge difference in the smell and texture of her frog area. I'm hoping by this weekend we are back riding and I will try to give you guys an update on how she progresses. I highly recommend having a bottle of Hoof Heal around not only as part of your routine horse care but also as part of your treatment routine for hoof injuries, thrush, foot rot, and especially if your in an area where dry hooves and cracking is an issue. You can learn more about Hoof Heal on the Cut-Heal website! Disclosure: We were given a a bottle of Cut-Heal's Hoof Heal free of charge, we were not compensated for this post in any other way. My opinions and comments on items we review are always my own and are never influenced by sponsors! The world's best stress relief! Thanks Piper, Ryt and Carla for an awesome day!